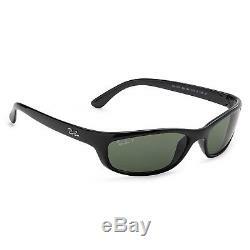 Ray-Ban RB4115 Predator Sunglasses (Black/Polarized Green Classic). Lenses eliminate glare and enhance contrast. Lens blocks 100% of the UVA and UVB harmful blue lights. 2x more resistant to impacts. 12x more resistant to scratches. Resistant to UV light moisture, heat, sea salts and more. Shaped by diamond tools to achieve no distortion. 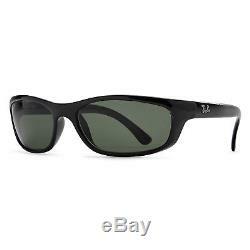 Ray-Ban Predator Sunglasses have serviced great men for many years with optimal results. Suave, cool and just a bit trendy, the Predator demands attention, and gets it with flying colors. Favored by many, the Predator will take you far. The classic black rectangle frame of the RB4115 sunglasses have all the charm of yesterday with the style of tomorrow. 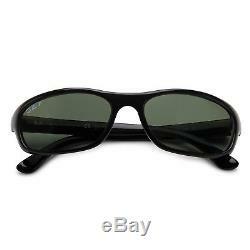 Add the polarized green classic lenses and you won't be able to take these sunglasses off. By absorbing 85% of visible light and blocking out most of the blue light, green lenses provide remarkable color contrast. G-15 green lenses ensure better clarity of vision and a more "natural vision". Polarized lenses eliminate glare, enhance contrast, reduce eye strain, and increase visual clarity. Polarized light is the sun light reflected by any surface, for example while driving, walking on the beach, or skiing on the mountains. That means a drastic reduction in the brightness of shiny surfaces, like chrome, and large bodies of water. Ray-Ban polarized lenses, are the result of more than 70 years of innovation and research, and they block more than 99% of the reflected lights. The polarized lenses offer anti-reflecting coating for clearer vision and more comfort in crystal plastic lenses. They also offer oleo-hydrophobic coating for longer lasting and easier cleaning lenses. Polarized lenses block the blinding glare that bounces off horizontal surfaces, for reduced eye strain and the greatest comfort of vision. The lenses are shaped by diamond tools to achieve no distortion. This is done in order to achieve the greatest precision in the lens. Every single lens blocks 100% of the UVA and UVB harmful blue lights. UVA and UVB blue lights are no joking matter, so Ray-Ban worked extra hard on making sure the harmful rays do not penetrate the lens. No lens is shatterproof or unbreakable but Ray-Ban lenses are pretty close. The lenses are 2x more resistant to impacts than common lenses. The Drop Ball Test was performed on the lenses where a steel ball is dropped on the lens from a height of 1.27m. After the chemical hardening, the impact resistance of Ray-ban glass is more than doubled. The lenses are 12x more resistant to scratches than common lenses. This was proven with the Bayer Test. The Bayer Test took the lenses and placed them into an iron box, the lenses were submitted to 500g of a special abrasive sand oscillating for 600 cycles. Compared to the most commonly prescribed lenses (CR-39), they are 12 times more resistant, thus exceeding by far the international standards. Resistant to UV light moisture, heat, organic solvents, sea salt, and sweat acidity; the lenses underwent the Quv Panel Test which confirmed all this. The Ray-Ban lens was exposed to consecutive cycles of UV light and moisture. The result after 120 hours of intense testing: no visible change in the color and no surface damages on the lens (crack, stripes etc). What's in the Box. 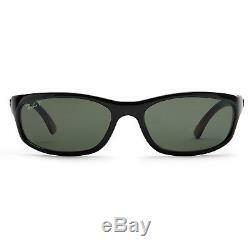 Color: Polarized Green Classic G-15. F There are product categories which are not returnable due to hygienic or sanitary as required by manufacturers. In an event where there is an error regarding a price error or description, we will notify you ASAP. Items removed from their'blister-pack' display packaging are non-refundable. 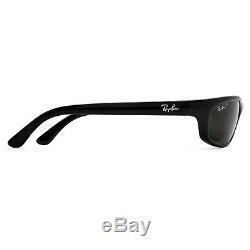 The item "Ray-Ban RB4115 Predator Sunglasses (Black/Polarized Green Classic)" is in sale since Monday, August 20, 2018. This item is in the category "Clothing, Shoes & Accessories\Unisex Clothing, Shoes & Accs\Unisex Accessories\Sunglasses & Sunglasses Accessories\Sunglasses". The seller is "asavings" and is located in Brooklyn, New York. This item can be shipped to United States, Canada, United Kingdom, Denmark, Romania, Slovakia, Bulgaria, Czech republic, Finland, Hungary, Latvia, Lithuania, Malta, Estonia, Australia, Greece, Portugal, Cyprus, Slovenia, Japan, China, Sweden, South Korea, Indonesia, Taiwan, South africa, Thailand, Belgium, France, Hong Kong, Ireland, Netherlands, Poland, Spain, Italy, Germany, Austria, Israel, Mexico, New Zealand, Philippines, Singapore, Switzerland, Norway, Saudi arabia, Ukraine, United arab emirates, Qatar, Kuwait, Bahrain, Croatia, Malaysia, Brazil, Chile, Colombia, Costa rica, Dominican republic, Panama, Trinidad and tobago, Guatemala, El salvador, Honduras, Jamaica, Antigua and barbuda, Aruba, Belize, Dominica, Grenada, Saint kitts and nevis, Saint lucia, Montserrat, Turks and caicos islands, Barbados, Bangladesh, Bermuda, Brunei darussalam, Bolivia, Ecuador, Egypt, French guiana, Guernsey, Gibraltar, Guadeloupe, Iceland, Jersey, Jordan, Cambodia, Cayman islands, Liechtenstein, Sri lanka, Luxembourg, Monaco, Macao, Martinique, Maldives, Nicaragua, Oman, Peru, Pakistan, Paraguay, Reunion.